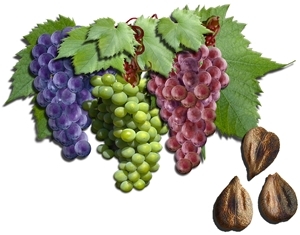 Grape seed extract is produced by purifying the most beneficial components from grape seeds. Among these components, most is known about proanthocyanidins – these molecules are produced in plants by combining several smaller molecules called flavonoids. Flavonoids are known for their antioxidant capabilities, and in proanthocyanidins this effect is even stronger, exceeding vitamins C and E . This activity makes them useful in protecting all systems of the body – they reduce UV damage in skin, ethanol damage on liver, ageing damage in brain and other negative symptoms associated with oxidation. Together with several other compounds found in grapes, proanthocyanidins are very promising anticancer drugs, as they were shown to reduce the growth of diverse cancer types . In skincare, the most important function of grape seed extract is protecting against sun damage. Solar UV is the primary cause of non-melanoma skin cancer, and it has been shown that applying grape seed extract before exposure significantly reduces the damage to cells . It is proven that proanthocyanidins are responsible for this protective action, as they enhance DNA repair in the damaged area . Similar results, leading to decreased cell death, were also found in another study . In fact, grape seed extract can even be used to treat skin cancer, as it is able to restore the genes in tumor cells to their healthy state . Similarly, melanoma cells can become less invasive, and thus less dangerous, after treatment with this extract . Application of grape seed extract on healthy volunteers’ skin, irradiated with UV, also reduced the cell damage that may lead to cancer . Furthermore, this extract inhibits the inflammatory processes that typically start after UV exposure. This also leads to reduced cancer risk . The antioxidative abilities of flavonoids are useful not only in response to UV. Using a cream with these and other antioxidants for 21 days, significant reduction in wrinkles was observed, as well as protection from UV – this indicates potential anti-ageing effects of this extract . New research also indicates that a cream containing grape seed extracts is able to protect against infrared A radiation – no other formulation has been proven to achieve this . These effects suggest that grape seed extract would be a valuable addition to any sunscreen, since no adverse effects of this extract have been observed . Grape seed extract also has other cosmetic benefits. In volunteers applying 2 % extract-containing cream, skin elasticity was significantly improved, together with decreased sebum secretion and melanin content (pigmentation) . Using a complex formulation with extracts from grapes and other sources, numerous skin benefits were observed, among them increased hydration, collagen content, and sebum reduction . However, the large proanthocyanidin molecules are absorbed rather slowly through skin. To enhance this process, it is advised to use this extract in high water content formulations, or apply together with hydrating agents . Finally, wound healing process is also aided by applying this extract. Not only do the wounds heal faster, but the regenerated tissue shows better structure and larger collagen amounts . Again, 2 % was the concentration of extract that gave the best results in these experiments . Additionally, grape seed extract is known to have strong antibacterial and antiviral properties. It is even able to destroy antibiotic-resistant bacteria, proving its usefulness in wound care . S. K. Katiyar, “Grape seed proanthocyanidines and skin cancer prevention: inhibition of oxidative stress and protection of immune system,” Mol. Nutr. Food Res., vol. 52 Suppl 1, pp. S71–76, Jun. 2008. M. Nassiri-Asl and H. Hosseinzadeh, “Review of the pharmacological effects of Vitis vinifera (Grape) and its bioactive compounds,” Phytother. Res. PTR, vol. 23, no. 9, pp. 1197–1204, Sep. 2009. A. Filip, D. Daicoviciu, S. Clichici, T. Mocan, A. Muresan, and I. D. Postescu, “Photoprotective effects of two natural products on ultraviolet B-induced oxidative stress and apoptosis in SKH-1 mouse skin,” J. Med. Food, vol. 14, no. 7–8, pp. 761–766, Aug. 2011. M. Vaid, S. D. Sharma, and S. K. Katiyar, “Proanthocyanidins inhibit photocarcinogenesis through enhancement of DNA repair and xeroderma pigmentosum group A-dependent mechanism,” Cancer Prev. Res. Phila. Pa, vol. 3, no. 12, pp. 1621–1629, Dec. 2010. M. Perde-Schrepler, G. Chereches, I. Brie, C. Tatomir, I. D. Postescu, L. Soran, and A. Filip, “Grape seed extract as photochemopreventive agent against UVB-induced skin cancer,” J. Photochem. Photobiol. B, vol. 118, pp. 16–21, Jan. 2013. M. Vaid, R. Prasad, T. Singh, V. Jones, and S. K. Katiyar, “Grape seed proanthocyanidins reactivate silenced tumor suppressor genes in human skin cancer cells by targeting epigenetic regulators,” Toxicol. Appl. Pharmacol., vol. 263, no. 1, pp. 122–130, Aug. 2012. M. Vaid, T. Singh, and S. K. Katiyar, “Grape seed proanthocyanidins inhibit melanoma cell invasiveness by reduction of PGE2 synthesis and reversal of epithelial-to-mesenchymal transition,” PloS One, vol. 6, no. 6, p. e21539, 2011. X.-Y. Yuan, W. Liu, J.-C. Hao, W.-J. Gu, and Y.-S. Zhao, “Topical grape seed proanthocyandin extract reduces sunburn cells and mutant p53 positive epidermal cell formation, and prevents depletion of Langerhans cells in an acute sunburn model,” Photomed. Laser Surg., vol. 30, no. 1, pp. 20–25, Jan. 2012. C. C. Felippi, D. Oliveira, A. Ströher, A. R. Carvalho, E. A. M. A. Van Etten, M. Bruschi, and R. P. Raffin, “Safety and efficacy of antioxidants-loaded nanoparticles for an anti-aging application,” J. Biomed. Nanotechnol., vol. 8, no. 2, pp. 316–321, Apr. 2012. A. Sharif, N. Akhtar, M. S. Khan, A. Menaa, B. Menaa, B. A. Khan, and F. Menaa, “Formulation and evaluation on human skin of a water-in-oil emulsion containing Muscat hamburg black grape seed extract,” Int. J. Cosmet. Sci., Nov. 2014. M. Haftek, S. Mac-Mary, M.-A. Le Bitoux, P. Creidi, S. Seité, A. Rougier, and P. Humbert, “Clinical, biometric and structural evaluation of the long-term effects of a topical treatment with ascorbic acid and madecassoside in photoaged human skin,” Exp. Dermatol., vol. 17, no. 11, pp. 946–952, Nov. 2008. O. V. Zillich, U. Schweiggert-Weisz, P. Eisner, and M. Kerscher, “Polyphenols as active ingredients for cosmetic products,” Int. J. Cosmet. Sci., Feb. 2015. S. Khanna, M. Venojarvi, S. Roy, N. Sharma, P. Trikha, D. Bagchi, M. Bagchi, and C. K. Sen, “Dermal wound healing properties of redox-active grape seed proanthocyanidins,” Free Radic. Biol. Med., vol. 33, no. 8, pp. 1089–1096, Oct. 2002. A. A. Hemmati, N. Aghel, I. Rashidi, and A. Gholampur-Aghdami, “Topical grape (Vitis vinifera) seed extract promotes repair of full thickness wound in rabbit,” Int. Wound J., vol. 8, no. 5, pp. 514–520, Oct. 2011. A. Al-Habib, E. Al-Saleh, A.-M. Safer, and M. Afzal, “Bactericidal effect of grape seed extract on methicillin-resistant Staphylococcus aureus (MRSA),” J. Toxicol. Sci., vol. 35, no. 3, pp. 357–364, Jun. 2010.